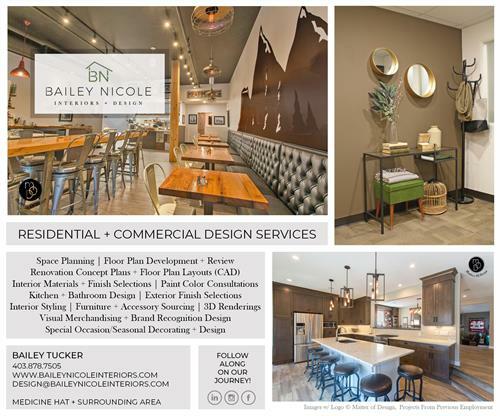 Bailey Nicole Interiors + Design is a boutique studio located in Medicine Hat, Alberta offering professional interior design expertise for both residential + commercial design projects, big or small. From a single room refresh to full-scale renovation or new build, we have services tailored to your project needs. We help clients by assisting + directing them through the design process of creating cohesive + beautiful interiors. We believe every space should be a true reflection of our client and inspire through character + functionality + aesthetics.